« As of tonight, we can place a headstone, with lettering, on the Royals’ 2016 season: R.I.P. OK, Missouri residents, time to slough off the scales of last week’s Republican and Democratic national conventions and focus on the tomorrow’s primary election, where several important races will be decided. The biggest race is on the Republican side, where four candidates have been waging an expensive fight for the nomination for governor. Are they stopped? OK. Here’s the new banner story: Tomorrow will be the first time since I moved to Kansas City more than 45 years ago that I’m going to march into the polling place — yes march, really high-steppin’ it — and request a “red” ballot. I’ve been thinking about this a lot, as you would expect, and I have three good reasons for entering what I’ve considered hostile territory for decades. :: I have no use whatsoever for Chris Koster, the heavy favorite to become the Democratic nominee for governor. As attorney general he has been bought and paid for by special interests, including the NRA. If you want proof of his groveling at the feet of commercial special interests, check out the first few paragraphs of this startling New York times investigative story from October 2014. I feel sure it will leave you disgusted. :: I think Republican candidate Catherine Hanaway is well qualified to be governor. And if Hillary Clinton is going to become the first female president, why not vote Hanaway in as the Show-Me State’s first female governor? They can dance arm-in-arm to The Missouri Waltz the first time Hillary comes to visit Missouri after winning the presidency. :: Koster will have little or no chance of winning the governor’s race in November, so I need to do what I can tomorrow to help my favorite Republican. (I have talked before about Republican usurpation of Missouri, and it bears repeating: In the last two decades, Missouri has gone from an up-for-grabs-state to solid Republican. The transition from fence-straddling to deep red was affirmed in 2012, when Barack Obama lost to Mitt Romney by 250,000 votes in Missouri, after losing to John McCain by less than 4,000 votes in 2008. There are several things I like about Hanaway, 52, who lives in Ladue in St. Louis County. She’s a proven leader. 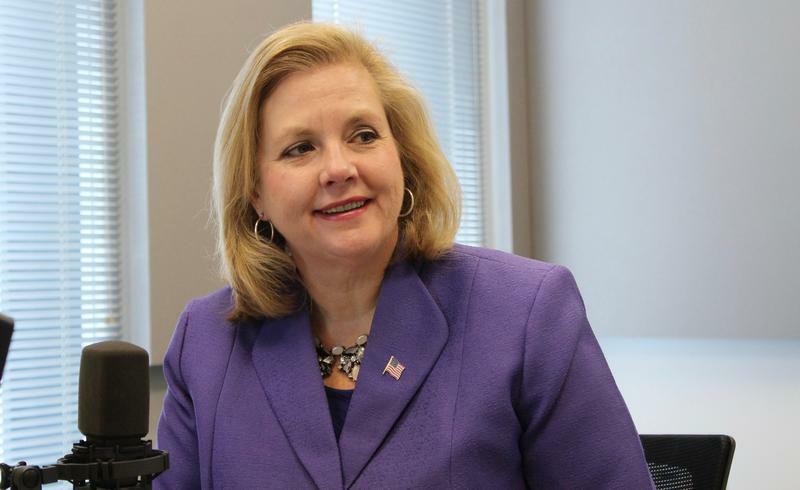 After being elected to the Missouri House in 1998, she became the first woman Speaker of the House in 2003. In 2004, she was the Republican nominee for secretary of state and narrowly lost to Democrat Robin Carnahan. In 2005, President George W. Bush appointed her U.S. attorney for eastern Missouri. After Obama replaced Bush in 2009, Hanaway resigned (she would have been replaced had she not) and entered private law practice. She is the only candidate to publicly call for a law mandating the use of police body cameras — a gutsy position that probably puts her at odds with a majority of members of the Missouri General Assembly. “Cameras don’t lie,” Hanaway has been quoted as saying. …I have concerns about Hanaway, and the biggest is that her biggest campaign contributor is multi-billionaire Rex Sinquefield, a St. Louiis area resident who has waged a one-man battle, mostly unsuccessful so far, to eliminate earnings and income taxes. The Star has reported that since 2008, when Missouri lawmakers voted to repeal voter-imposed campaign contribution limits, Sinquefield has spent more than $45 million on donations to various candidates and committees in Missouri. I am completely against Sinquefield’s push to shift more of the tax burden onto middle-income and poor people, but as I stand back and look at the governor’s race, I find more to like about Hanaway than any other candidate, by far. As usual, it’s a roll of the dice. The difference is this time I’m rolling in a completely unfamiliar alley. Why are you voting GOP???? Patty should change the locks! I’m not only getting crankier, I’m feeling more dangerous. Thank God, man, you’ve come to your senses. Must have been the anesthetic. A scene I never imagined. Catherine, Rex S and Jimmy C with arms joined high overhead after an election victory in November. Can the Koch Brothers and Brownback support be next? Dear God, just give me a winner! That’s Hhuuuge Jim. Mak’in Mo Great Again eh? Just don’t make a habit of it. Use to be you could vote common sense and things usually worked out all right. But these days seems like any common sense is just being bred out of the candidate gene pool. I think the pain meds have made you irrationally exuberant; Hanaway’s as much of Sinquefield’s lapdog as Koster is the NRA’s. Her only saving grace is that she isn’t a psycho like Greitens. Your points are well thought out and I will definitely take this rationale into consideration. To your point about the earnings tax, I would remind you that it is much more regressive than a sales tax. * A sales tax denies us an additional 9-10% of every post-tax dollar. The earnings tax takes the whole dollar. * For taxpayers filing a long form that’s not much of an issue, but for the working class it’s off-the-top and it hurts like crazy. What, no post-analysis? No gnashing of teeth?